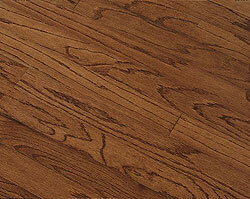 Types of Wood Flooring : Wildwood Floors, Inc. There are very few flooring materials that have stood the test of time as long as wood. 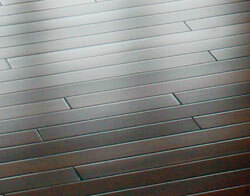 Wood floors that are properly cared for can last for hundreds of years as witnessed in Asia and Europe. While natural stone and granite are also extremely durable, they do not provide the warmth and relaxed feel associated with hardwood. 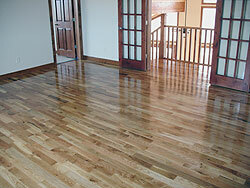 Wildwood Floors installs many types of hardwood flooring. Engineered hardwood flooring is real wood flooring, but is more stable than solid wood and is less susceptible to shrinking and expanding with changes in temperatures and humidity. The durability of engineered hardwood is increased by constructing the floor through the use of multiple wood layers. Most engineered hardwood materials can be refinished after years of wear. Whether you choose pre-finished hickory wood flooring or oak flooring, domestic wood pre-finished typically costs more than traditional wood. However, this is to be expected, as pre-finished wood flooring leaves out most of the labor that comes with finishing and sealing a floor. If you’re looking for high-quality wood and want to reduce any labor or maintenance costs associated with installing traditional solid hardwoods, choosing pre-finished hardwood flooring allows you to set up a brand new floor with minimal labor. Pre-finished solid hardwood does not install to a flat finished like true hardwood. As noted in the picture to the right, you can see the curved edges result in more noticeable seems after installation. Pre-finished solid hardwood can be refinished after years of wear. Longevity – Solid wood floors last for hundreds of years. Over the centuries, wood has proven itself to be a durable floor choice. Newer synthetic materials have been unable to stand the test of time. Coziness & Warmth – Wood is naturally warm, holds the surrounding temperature and is an excellent insulator. There are thousands of air channels within each piece of hardwood which hold in the surrounding heat. Hypoallergenic – For people with environmental allergies, hardwood is a must. Unlike carpet, wood does not harbor mildew, mites & pet hair. Easy to Clean – Sweep, mop a little and you have a spotless floor. While hardwood floors are easy to repair, if you do get a gouge or a scratch in the floor, it often adds to the character. Modern finishes eliminate the need for waxing & hand buffing. Thank you for a wonderful job you did with the installation of our tile in the kitchen hallway and bathroom. We really appreciate your help, your attention to details and all of the hard work you put into the removal of old flooring. I have more work for you with hardwood floors in the future.